I was not really prepared for what awaited me at Grande Dunes. It had been perhaps a decade since I visited Myrtle Beach, long before this new 2,200-acre upscale Yet from the moment I arrived, pulling into the drive for the Marina Inn, it became immediately clear that I'd have to revise my notions of the target demographic for this region. Just beyond the hotel—which overlooked a marina on the Intracoastal Waterway—a guardhouse marked the entrance to a private residential community, accessible by bridge and home to two golf courses (one by Nick Price/Craig Schreiner, the other by Roger Rulewich) and multi-million-dollar mansions. To the east, a boulevard through the trees ended at a the Grande Dunes Beach Club, whose marble floors mimicked those back at the Marina Inn, even as it surveyed an inviting swath of dune-backed beach. While just to the north huddled the 10 clay courts of the Grande Dunes Tennis Club. Obviously, I was about to enjoy a level of comfort and amenities not traditionally associated with this region of South Carolina. Until Grande Dunes' developers came along and incorporated the tennis courts into their panoply of recreational amenities, this had been the Myrtle Beach Tennis Club. It had been built by a consortium consisting of Arthur Ashe, Dennis Ralston, Stan Smith, Bob Lutz, Marty Riessen, Charlie Pasarell, Roscoe Tanner, and Tom Gorman. It backs up to the Intracoastal Waterway. Its clubhouse in white and pastel stucco with white trim holds the pro shop and a fitness center with cardio equipment and dumbbells and windows outdoors. There's also a postage-stamp swimming pool—at least for now. Personal trainers are available as a poolside yoga classes. A 1970s era photo of the group appears on the wall of the club. "Every few years Stan Smith calls me and says 'I want that photo,'" John Mack tells me as he shows me around. He had managed the club for the consortium and continues to run in. Tennis Programs. Locals rave about the game matching and I took advantage of an afternoon drill session and then filled in for a combined doubles drill/playing session the next morning. Local membership ensures playing opportunities for hotel guests. Courts & Fees. Ten Har-Tru courts fan out from the clubhouse and its outdoor patio. 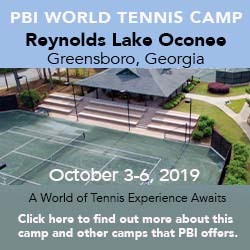 That patio faces a single clubhouse court, while the others are laid out in pairs, threes, or fours with angled corners, half fences and blue awnings over wooden benches separating the courts in their groups. Trees and palms border the perimeter. Beach. The Grande Dunes development begins along the beach and extends inland past the Intracoastal Waterway. Guests and members have access to an exceptionally elegant Ocean Club with marble floors and handsome swimming pool built behind the dune line. Boardwalks arch across the dunes to provide a means to reach the broad, sandy beach. Golf Courses. The Myrtle Beach region is renowned for its golf, with more than 100 courses in the corridor from Georgetown in the south to the North Carolina border in the north. Grande Dunes added two 18-hole courses of its own to that inventory. Members Club at Grande Dunes: Nick Price collaborated with Craig Schreiner to create this 18-hole course, which weaves through the area's pine preserves and along the Intracoastal Waterway. Yardage: 5,972-7,002 yards. Par: 71. Spa & Fitness Center. 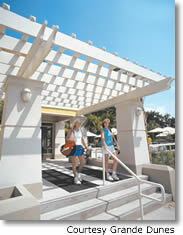 There are two fitness center: one in the Marina Inn, a second, larger facility at the Tennis Club. The Inn also has a large and attractive freeform swimming pool and Jacuzzi on the patio overlooking the marina as well as a small heated indoor pool. Spa services, meanwhile, are available at the Hibiscus Spa in the Myrtle Beach Marriott Resort & Spa at Grande Dunes (see Lodging below), adjacent to the Ocean Club. Accommodations at the Marina Inn range from a 450-square-foot hotel room with a balcony to suites ranging in size from one to three bedrooms. Those suites are notable both for their spaciousness and range of amenities, including fully-equipped kitchens, large living room/dining room areas, and such amenities as CD/DVD players and wireless Internet access. Two- and three-bedroom units add gas-log fireplaces and washer/dryers. As you'd expect, the Inn has its own restaurant, Waterscapes, open for breakfast, lunch, and dinner for cuisine that highlights local specialties and produce. The golf clubhouses and Ocean Club provide further options, and so does the Marina, which has a friendly, low-key Anchor Cafe on the Intracoastal Waterway itself and a Ruth's Chris Steakhouse. Travel Instructions. By Air: Grande Dunes is 15 minutes from Myrtle Beach International Airport (MYR), which is served by most of the major airlines and several regional carriers. General Tourist Information. Visit the Myrtle Beach Convention & Visitors Bureau website or contact them at 843-626-7444 or toll-free 800-356-3016. So far, I haven't received any written feedback on Grande Dunes. If you've taken a tennis vacation there, I'd like to hear your reactions.